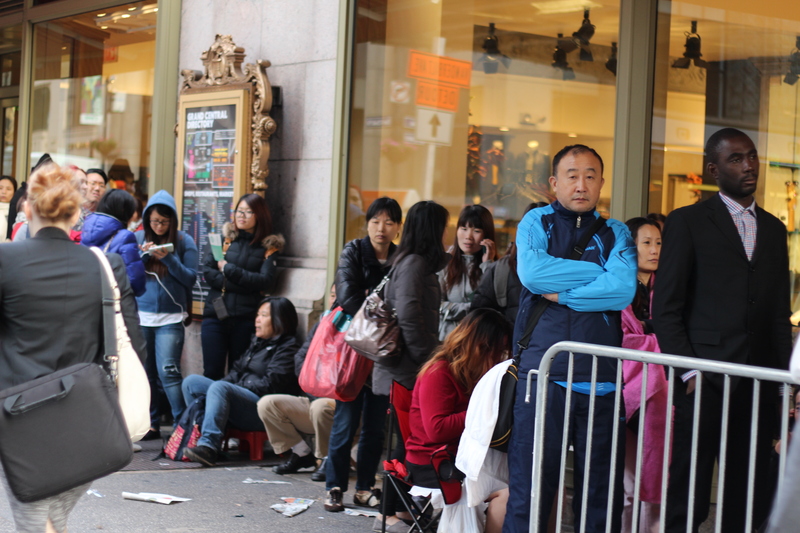 Yes, people lined up last night for the latest iPhone. Despite over 4 million pre-orders and a new system that lets line-waiters take a number on their iPhone, there were still hundreds of people lining up at the Grand Central Apple Store on Friday morning in New York City before the 8am iPhone 6 and iPhone 6 Plus launch. The line I saw wrapped around two sides of the Midtown block. At the front of the line, the people queueing up were mostly Chinese immigrants, with the customer mix getting more diverse as the line stretched backwards. 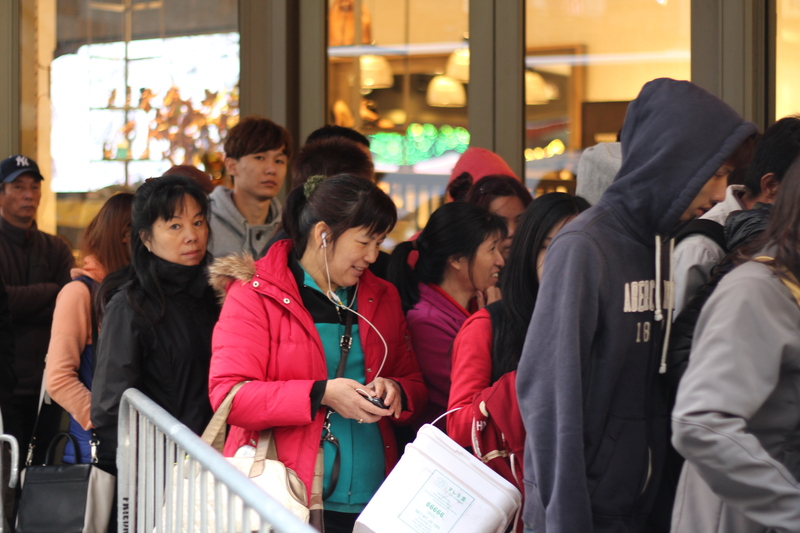 Chinese immigrant resellers used to be a common sight at New York [company]Apple[/company] launches, but the phenomenon had waned in recent years as China started to get the iPhone on the same day as the United States. But since China currently is not yet scheduled to receive the iPhone 6 — at least until some regulatory issues are sorted out — the resellers are back out in force. 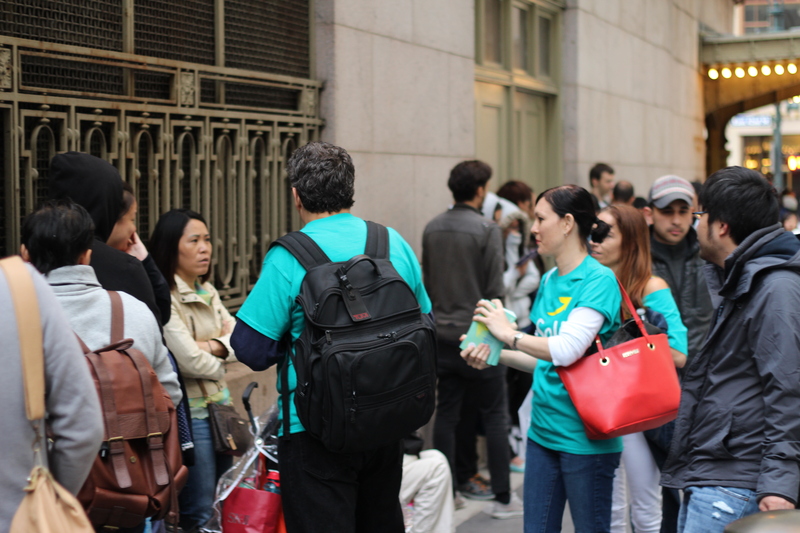 When arriving at the line, an army of Apple Store staffers proactively guided customers to the right spots. People who had pre-ordered using the new digital reservation system got shifted to a shorter line, whereas the rest of the people without an reservation email from Apple — some of whom did not know you could pre-order — had to queue up and take what was left. One young man, Peter, did not expect to get what he came for. Although he had started lining up at midnight, he did not think he would get the iPhone 6 Plus he wanted because Apple Store staff “came around and told us the Plus would be done by the time they got here.” He was in the first third of the line without pre-orders. Several businesses tried to take advantage of the large captive crowd on a New York street. 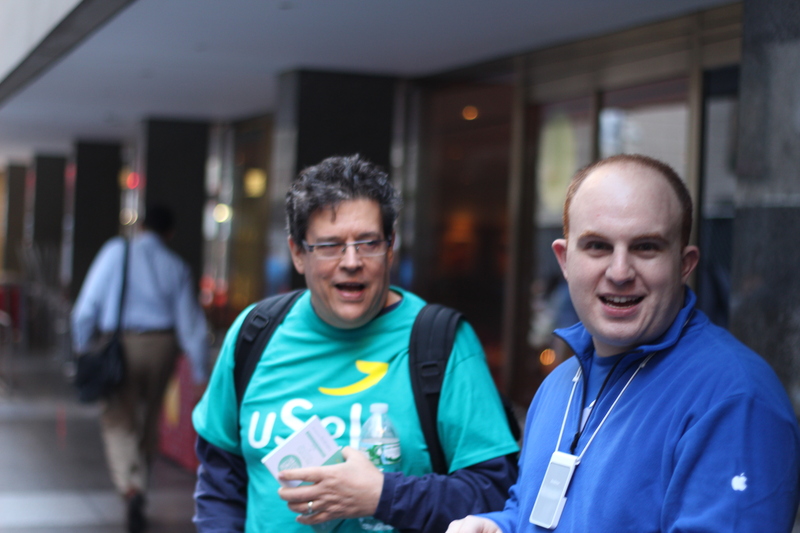 Representatives from USell and iCracked looking to buy old devices went from person to person, handing out fliers promising to buy people’s old phones at a better price than the Apple Store. I guess today is the day for Apple to call all the iSheep flock back home for their sheering with iPhone 6â€™s going on sale in stores today. Apple provides as little in the way of internal storage, ram, and hardware in their iPhones as a way to force people to spend more up front or upgrade when Apple tells its fans too. iOS 8 could easily have loaded on iPhone 4â€™s but Apple intentionally provided so little ram to make these phones obsolete and force its fans to upgrade today. iPhone6’s will be obsolete in just a few years when Apple requires 2GB or more of ram which pretty much every other modern smart phone already has included for the last few years. I love Apple as much as anyone but I would not stand in line for a new phone. Either wait a couple of days or order it off their website. I saw the long line Friday at 6 AM as the people were just being allowed into Grand Central Terminal. But the store doesn’t usually open till 7.